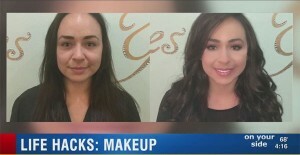 On Tuesday morning, May 3rd, 2016 camera crews rolled into our Salon and Spa to film a special feature on our Eyelash Extensions and a “How-To” on a quick and easy makeup look! We were sought out by Gayle Guyardo from Channel 8 news, who asked to do a segment on our Salon and select services we offer. We can’t thank Gayle enough for taking the time to reach out to us and to help spread the word about our booming business! Didn’t catch us on the News? Click HERE to watch the video. Tips and Tricks for a busy mom, or business professional who’s always on the go! Always use a primer! This will ensure that your makeup lasts all day long and stays in place throughout the movement of your busy day! No need for loads of makeup brushes… you only need 5! A fluffy powder brush, an angled blush brush, a flat foundation brush, and 2 eyeshadow brushes; one fluffy one to get in the crease and blend everything together and a flat pigment brush to apply your eyeshadow smoothly! Awake but your eyes aren’t looking as awake as you’d like? Try using a light matte shade under your eyebrow, this will pull everything up! Also add a pop of a bright and frosty eyeshadow in the inner corner, this will make your eyes appear brighter and more awake! Feeling daring and want to try a winged liner? We suggest practicing in your spare time, try using a spoon, tape, or tweezers to get your line perfected! For the lips, you don’t necessarily need a lipstick! You can use just a lip liner, line your lips, and blend the color into the center of your lips creating an ombre effect! Then just add a little lip gloss in the center! Last, but certainly not least, the best hack ever is Eyelash Extensions! This way you can save time from not needing mascara or false lashes! A huge thank you to Gayle Guyardo!